Spring is the best season of the year to live your floral fantasy.This season floral trend is classic meets modern femininity. Taking the form of flirty dresses, exquisite gowns, tailored suits, floral jewelries,accessories, flowy skirts and silky jumpsuits alike. If you’re not keen on approaching a head-to-toe floral look, this season offers plenty of equally stunning alternatives. Spring Cleaning Sale Event-Save up to 70% + Free Shipping. Its that time of the year again. Our spring cleaning sales event starts today. Join us at www.Ladiesfashionsense.com for the spring cleaning sale. Come on in for great savings. Now is the perfect time to find a special treat for your, a gift for mom or for the graduate.All stock is 20% off. Clearance items are also and additional 20% off. Prices are already discounted for your convenience. Enter Discount Code "Spring14" at checkout. Happy Shopping & Spring Cleaning! Jennifer Lopez sizzled during FOX’s ‘American Idol XIII’ Top 10 to 9 Live Elimination Show on Thursday March 2014in Hollywood, California. The singer showed her wild side in a Rachel Zoe Pre Fall 2013 Leopard Sequin Mini Dress with tonal blazer with black satin lapels. Keeping the black-n-gold theme going, she styled the look with Giuseppe Zanotti Design patent-leather pumps with a gold heel. She completed the look with chunky gold bracelets, and some fabulous pyramid earrings. St. Patrick’s Day is around the corner; we are starting out our celebration of all things green early. 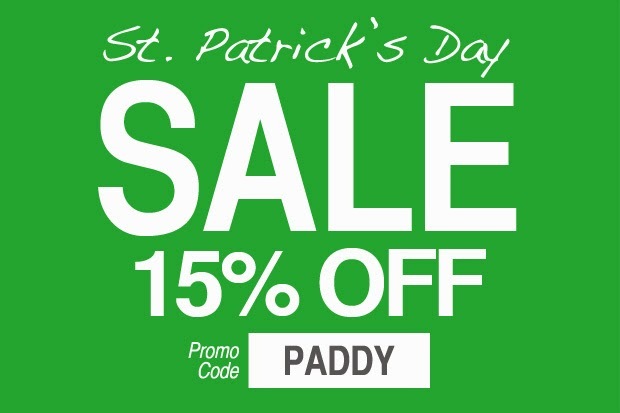 To celebrate St. Patricks day, www.ladiesfashionsense.com, we are offering up a discount off our entire store for two weeks only!! Starting today and going through Sarturday, March 22nd, enjoy 15% OFF your entire order!! Act now as we are just receiving some new Spring must-haves. Don’t forget to enter the discount promo code: "PADDY" at checkout, to get the discount. Happy birthday, to all the March babies! Aquamarine is the March birth stone: The word Aquamarine is derived from the Latin words "Aqua Marina" which means "sea water" which reflect the color of the crystals. A transparent, pale green variety of beryl, used as a gem. Take your pick of our beautiful aquamarine birthstone pieces here below.